For information on booking Sonya to speak at your event, click here. A candid conversation with the Diversity Committee of XYPN. You do not need to be a XYPN member to join the webinar. In this workshop, I’ll cover the basics of Impact, SRI, and ESG investing, and then talk about how financial planners are uniquely positioned to capitalize on the increasing demand for this type of investing and successfully adopt into their practices. An educational and practical conversation with Sonya, Jon Hale, Morningstar’s Global Head of Sustainability Research and Anna Snider of Merrill Lynch. In this conversation, geared towards financial advisors, we’ll go beyond the “what” of ESG and Impact to discuss how to practically implement sustainable investing into their practices. Along with Paul Herman of H.I.P. Investor and Cat Berman of CNote, a conversation about the state of impact investing products and what’s missing, plus ideas and food for thought during these volatile times. In addition to CNote and HIP Investor, we may also discuss investing for income and impact examples like MicroVest, TriLinc, Calvert, and The Nature Conservancy. Sonya will be teaching module 4 of the The US SIF Foundation's course, Fundamentals of Sustainable and Impact Investment. Sonya Dreizler takes the main stage on night 1 of the conference to shares her career story, her thoughts on what it takes to succeed in the field of SRI, and what the next years and decades hold for the industry. Today, environmental, social and governance investing—known as ESG— is creating diversification, returns and new client growth for savvy financial advisers. InvestmentNews Research estimates that $150 billion in alternative assets could be added to client portfolios over the next three years – while roughly 85% of all clients are now expressing interest in learning more about alternative investment strategies. Find out where we are and what’s next for this evolving sector. The panel will share their ideas for incorporating these cutting-edge strategies into your menu of offerings to appeal to existing clients and attract new ones. For over five years, the Women Adviser Summit has hosted over 1,600 women across the country with the goal of investing in their business, their brand and themselves, all while collaborating and networking with like-minded peers. Join in on the experience! Sonya Dreizler, a former financial services CEO and impact investing expert will discuss the importance of impact investing in client portfolios and client relationships. She will cover an overview of the definitions of Impact, ESG, SRI, and Sustainable Investing. We'll discuss the importance of incorporating ESG considerations and impact opportunities into investment evaluation, and how to strengthen your relationships with clients by incorporating impact investing. The session will include time for Q&A, and Sonya will share practical tips and resources to use in your practice immediately. Who: Gloria Nelund, CEO and Founder of TriLinc Global, and Sonya Dreizler, Founder of Solutions with Sonya, impact investing and business management consultant. What: Your Money's Voice - Women & Investing in 2018: an insightful, impactful and educational webinar on women investors. As a follow up to this month's FPA Journal cover story, Marketing Failures and Fixes, three of the experts featured in the article will discuss common marketing mistakes, how to avoid them, and best practices for marketing a financial planning practice. Total Impact focuses on best practices and executable opportunities across asset classes for all practitioners, regardless of their prior impact knowledge. Sustainotopia is one of the leading events in the world for social, financial and environmental sustainability & impact celebrates its 10th year as a company! The panel will discuss why and how to integrate impact investing solutions into client portfolios and relationships. We will cover a short overview of the definitions of impact, ESG, SRI, and green investing. We'll discuss incorporating ESG considerations and impact opportunities into investment evaluation, and how to strengthen your relationships with clients by talking about the impacts of their portfolios. The session will include practical tips and resources to use in your practice immediately. Are you really aware of what your clients care about and need? 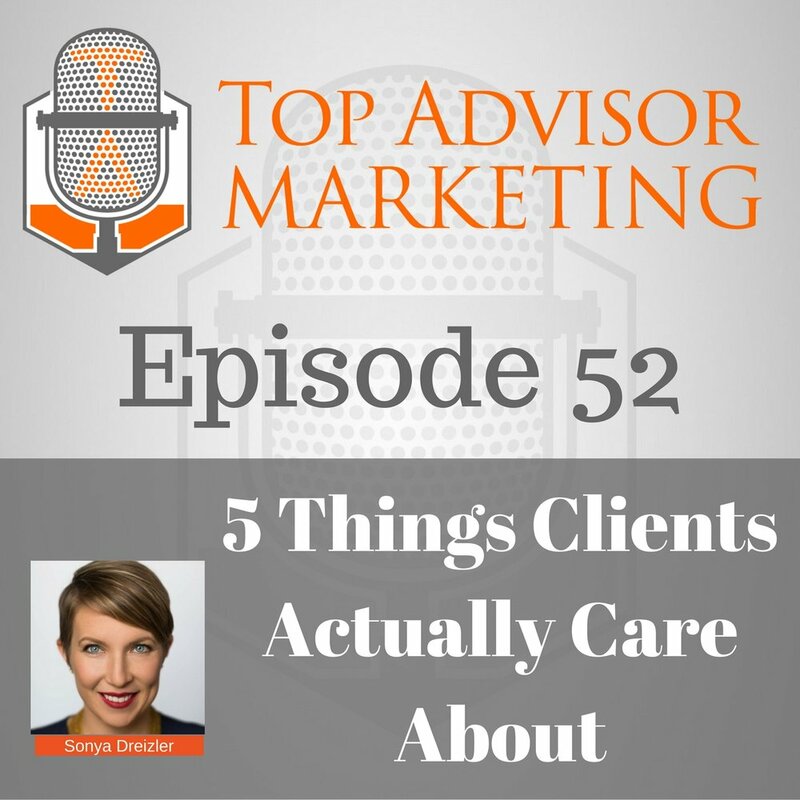 Sonya joined Matt and Kirk of the Top Advisor Marketing Podcast to discuss the 5 things clients ACTUALLY care about. Financial advisors often base the cares of their clients on their own personal cares, which often leaves them presenting clients with information or action that doesn't resonate. By incorporating these 5 things into your practice, you will be able to give clients the experience they need to ensure their continued satisfaction and happiness. By Invitation Only: For NorCal NAPFA Group Members Only- ask Sonya for an intro if interested. Our speakers will discuss the importance of impact investing in client portfolios and client relationships. We will cover a short overview of the definitions of impact, ESG, SRI, and green investing. We'll discuss the importance of incorporating ESG considerations and impact opportunities into investment evaluation, and how to strengthen your relationships with clients by incorporating impact investing. The session will include time for Q&A, and we will share practical tips and resources to use in your practice immediately. Join Hanson Bridgett, Solutions with Sonya, Glass Lewis, Just Invest, MSCI, and SASB for a discussion on how you can make a positive impact with your financial choices. Our expert executives from the legal, investing, and banking world will share perspectives on investing with intention, public vs. private impact investments, and banking and lending with positive intention. The panel will also give their opinions on the different flavors of impact as well as their views on the outlook for growth in ESG and impact investing over the next 3-5 years. They will discuss barriers to adoption and potential solutions to move greater amounts of capital to investments that maximize returns and have a positive impact on the overwhelming environmental and social issues of today. Each panelist will share a story of individual career success, sharing tips and ideas with the audience on growing their own careers. We expect nearly 75 investing, lending, and legal professionals in the audience. Attendees will include portfolio managers, bankers, lenders, financial advisors, CIOs, relationship managers, research analysts, principals of RIA firms and family offices, pension & endowment advisors, fintech entrepreneurs, and more. This session is designed to provide guidance and best practices for newly-minted as well as seasoned advisors offering responsible investment strategies. This dynamic expert panel will share their journey in building a successful practice and offer key considerations integrating sustainable, responsible, impact investing into their practices. The discussion will cover the alphabet soup of terminology, screening the universe of SRI asset managers to determine best fit for clients, and how to conduct due diligence on this growing segment of the financial services industry. ESG Marketing and Client Acquisition – How to brand yourself as an ESG expert and attract clients interested in ESG to your practice. ESG Data – Exploring whether ESG integration adds alpha and/or reduces risk in portfolio design. RIA Perspectives on ESG Investing – An opportunity to learn from large RIA’s that are successfully incorporating ESG strategies into their investment process and business models. This event is intended for financial services professionals. In this first event of the relaunched ESG Speaker Series, we'll chat with Jens Peers, CIO of Mirova and Portfolio Manager of The Mirova Global Sustainable Equities Fund. Mirova is a Paris based affiliate of Natixis Global Asset Management focused on responsible investing. For more information about the event, and for an invitation (financial services professionals only), please contact Sonya. Do you find yourself busy but not actually achieving your big picture business goals? Do you wish you had more time to grow your firm? Help is on the way! Join me as I guest host a 25-minute webinar for Kristin Harad, marketing trainer and coach for financial advisors. Plus, we'll do the first step together on the webinar. Register now to join us! By Invitation Only: For Marin RIA Quarterly Coffee Members Only- ask Sonya for an intro if interested. I will discuss the importance of impact investing in client portfolios and client relationships and will cover a short overview of the definitions of impact, ESG, SRI, and green investing. We'll discuss incorporating ESG considerations and impact opportunities into investment evaluation, and how to strengthen your relationships with clients by incorporating impact investing. The session will include time for Q&A, and I will share practical tips and resources to use in your practice immediately. In this podcast, I speak with business coach and social media expert, Matt Halloran, as well as Kirk Lowe, founder of Top Advisor marketing, RIA branding expert. We talk about both the why and the how of leveraging impact investing in your marketing, and how it helps to attract and retain great clients. In this informal session, we'll cover goal setting, time management, website and social media basics, and the importance of proactive outreach to clients and prospects. Depending on attendee interest, we may also discuss invoicing and time tracking tools. Our panelists will discuss the importance of impact investing in client portfolios and client relationships. Their presentation will include a short overview of the definitions of impact, ESG, SRI, and green investing. They will discuss the importance of incorporating ESG considerations and impact opportunities into investment evaluation, and how to strengthen your relationships with clients by incorporating impact investing. The session will include practical tips and resources to use in your practice immediately. In this concentrated and interactive practice management session, Sonya will present three effective time management tools to help you focus your daily efforts towards meeting your business goals. We will discuss practical and concrete steps you can implement in your practice immediately, and will do the first step together, in the session.